FA Paul Granthem, Jim Schwarz, August 1988. 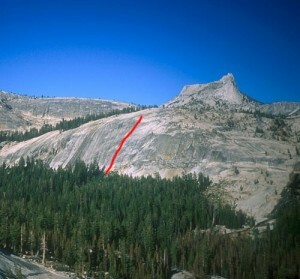 Outstanding climbing up a thin seam to a wild roof/bulge (some call this route The Bulge). While the thin face first half is technically harder, the bulge crux may be tricky for shorter folks, but luckily two very closely spaced bolts protect it tightly. Which SuperTopo guidebooks include a topo for Disintigration?